It wasn't a snap decision. After two years on the sidelines, BTIG analyst Rich Greenfield upgraded shares of social media company Snap to a buy rating Thursday. The stock surged more than 12 percent on Greenfield's call that the name can reach $15 based on advertising growth. "[D]o not chase a position on a fear of missing out," Bill Baruch, president of Blue Line Futures, said Thursday on CNBC's "Trading Nation." From a technical standpoint, he contended the stock faces "tremendous resistance with the trend line from its high." He noted that if the stock could break the resistance and close above $12, tail wind momentum could lift it to $14 - $17. But on the flip side, Baruch believes the name could just as easily reverse course and fall back to $7. So given the potential downside, he argues to "stick to your game plan" and says "don't chase it." 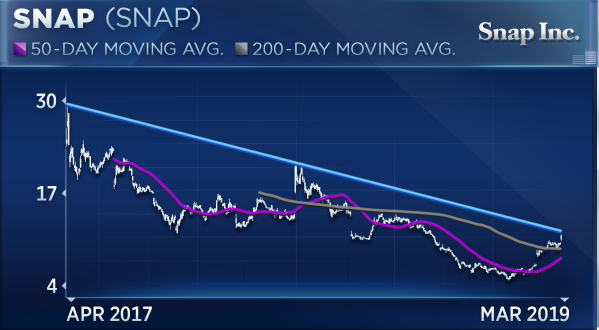 Mark Tepper, president and CEO of Strategic Wealth Partners, said he wouldn't be a buyer of Snap until the company can prove it can appeal to a broader user base. He said that it has a "cool product" and that it's the "most preferred social networking program among teenagers," but the problem, according to Tepper, is that teenagers are not the ones with money to spend. This means the platform is less valuable from an advertising standpoint. "[T]eenagers don't have the deepest pockets and they [Snap] are really struggling to attract the 35-plus crowd. Those are the people with the spending power," he said, adding that "[t]hey're seeing revenue per user that's about half of what Twitter realizes." The stock would be "intriguing" at $6, Tepper said, but for the time being, and after the surge higher, he said it's a tough name to get behind.